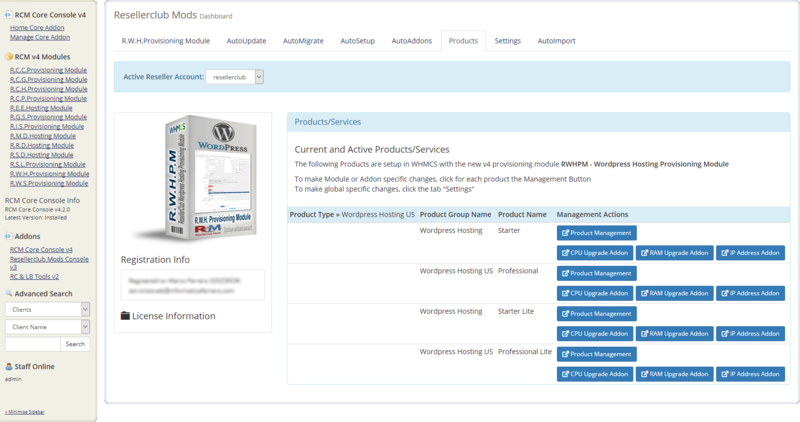 Download RWHPM - Wordpress Hosting Provisioning Module from the product license details page TAB "Downloads". Unzip the file with your prefered decompresion software. Upload the complete folder "modules" from the unzipped local folder \rcmrwhpm_X.Y.Z_PHP_5.X\ into the whmcsroot/ folder. The "whmcsroot" folder is where you have installed your WHMCS. 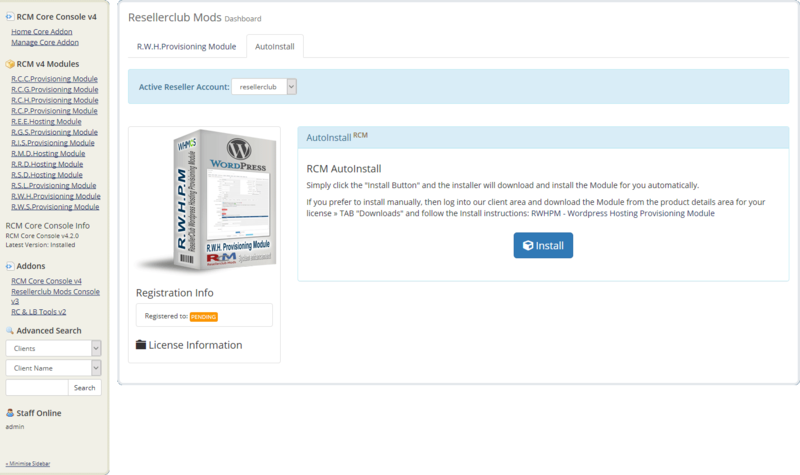 Goto to WHMCS » Addons » RCM Core Console v4 and access the R.W.H.Provisioning Module Dashboard from the left sidebar Addon Menu or from the Core Addon Home widget and click the "Validation" Button below the license details to finish the manual install. 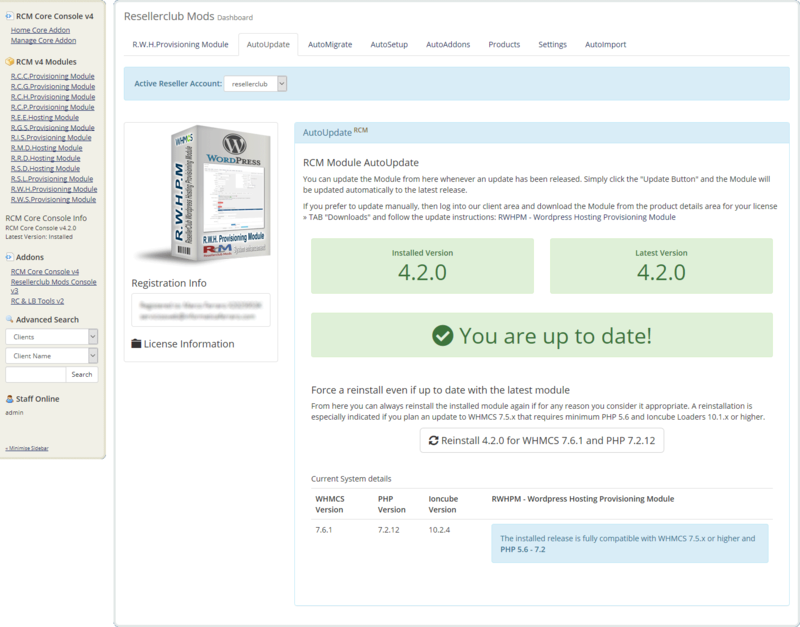 To manage the Module, navigate in WHMCS to » Addons » RCM Core Console v4 and access the R.W.H.Provisioning Module Dashboard from the left sidebar Addon Menu or from the Core Addon Home widget. 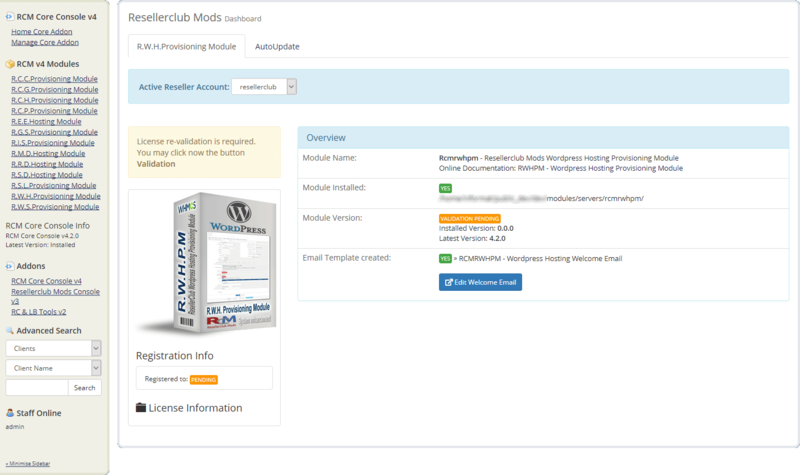 If this is the first time you install our Module to sell and manage Wordpress Hosting plans, then start right away with the AutoSetup Guide. 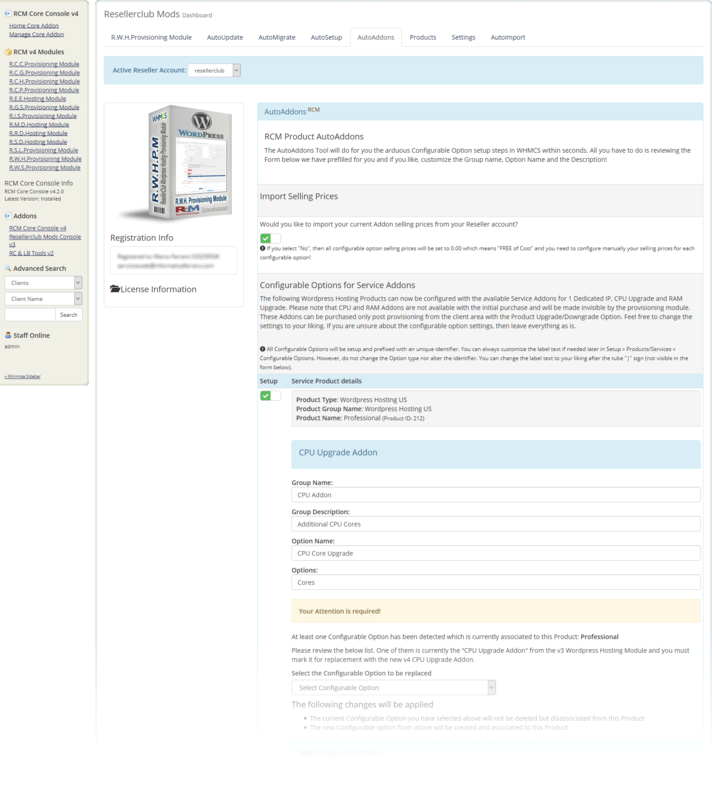 Once you have setup the Products you would like to sell, proceed with the AutoAddons Guide. 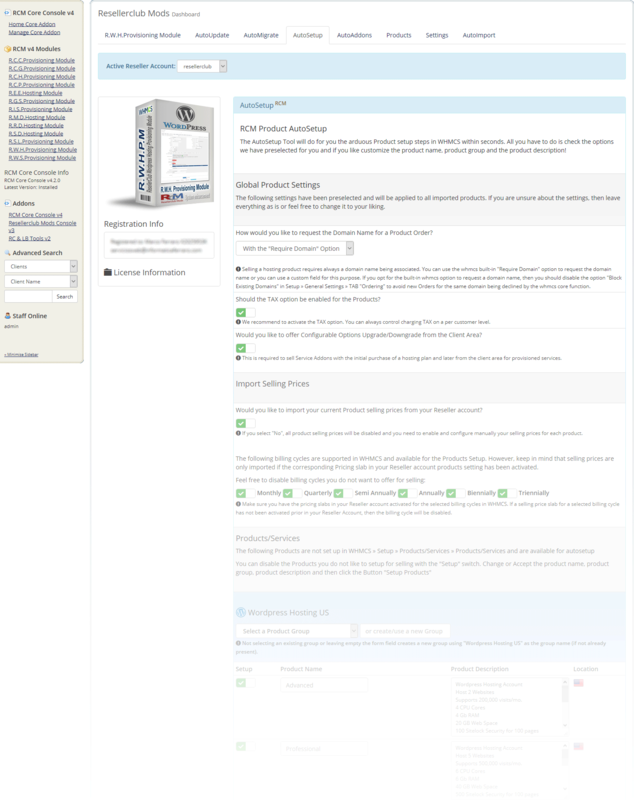 If you are using our v3 Module, then we suggest to start directly with the AutoMigrate Guide. 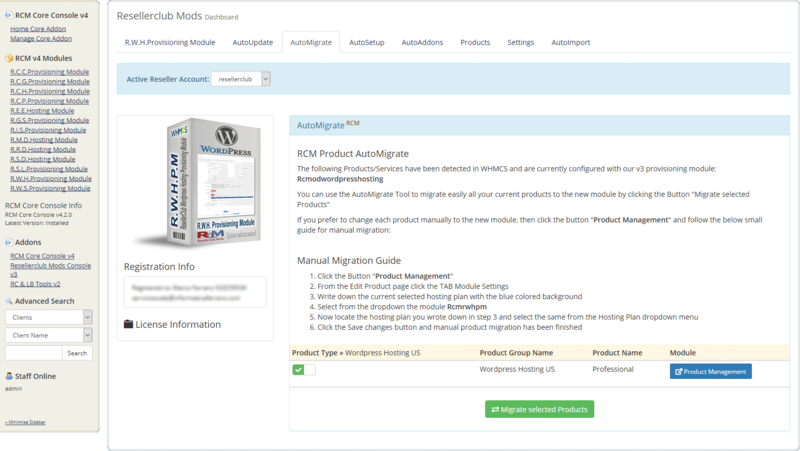 Once you have migrated all your Products from the current v3 to the new v4 Module, proceed with the AutoAddons Guide. By default, Selling Prices for Products/Services and Configurable Options will not be updated automatically with the Selling Prices from your Reseller Account when the daily cron runs. You can activate this option in TAB "Settings" or you can use the Button "Selling Prices ManualSync" to update all your Product Selling Prices in WHMCS. Both Options, AutoSync as well as ManualSync will fetch your Selling Prices from your Reseller Account. By default, Recurring Prices for Products will not be updated automatically with the Selling Prices from your Reseller Account when the daily cron runs. You can activate this option in TAB "Settings" or you can use the Button "Recurring Prices ManualSync" to update all Active Customer Products. Prices for all Configurable Options (Product specific and custom configurable options if present) are included into the recurring price update. Products with a recurring price set to 0.00 are considered as FREE and therefore excluded from the recurring price update process. Whenever we release a new update you will be notified instantly by accesing the Management Area in TAB "R.W.H.Provisioning Module". From TAB "AutoUpdate" all you need to do is click the Update Button and the Module will be updated automatically to the latest available stable release. 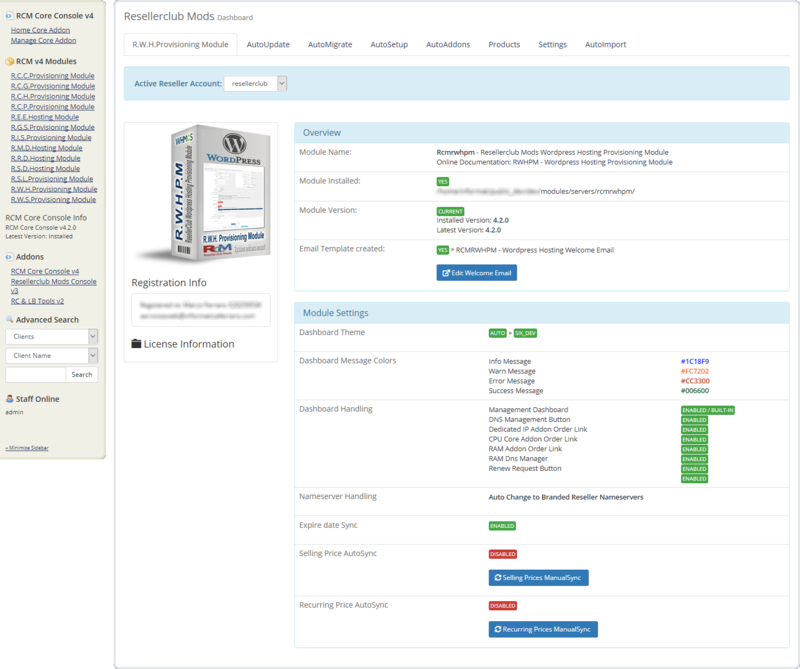 Goto to WHMCS » Addons » RCM Core Console v4 and access the R.W.H.Provisioning Module Dashboard from the left sidebar Addon Menu or from the Core Addon Home widget. Click the "Validation" Button below the License Information to finish the manual update. This tool will create the required Configurable Options to sell CPU Cores, RAM Gb and one additional IP for each Wordpress Hosting Product. Not only that, the tool also will take in mind the migrated v3 products, creating the necessary new v4 Configurable Option for the migrated Product as well as update all Customer Services who still have the previously Addon from the v3 module associated! Unlike the new v4 module, all Wordpress Hosting Products across all Geolocations have shared the same Configurable Option using the old v3 module. The advantage of one unique Configurable Option was the pricing maintenance. However, the disadvandage with sharing the same Configurable Option is that not all Wordpress Hosting Services do have the same cost price for Addons and you were forced to apply the highest selling price to avoid loss of benefit. The correct way to solve this problem is creating for each Product dedicated Configurable Options but which makes maintenance a real nightmare if you have dozens of products. With the new v4 module everything is automated and the Core Addon will do everything for you automatically. A new Configurable Option will be created for each new Product. For migrated v3 Products, the Addon will create a new Configurable Option and if there are Customer Services present using a migrated Product, they will be updated automatically with the new Configurable Option and the recurring price will be re-calculated correctly. Furthermore, the AutoSync Recurring Price feature will update all your recurring prices periodically with your selling prices from your Reseller Account, if activated in TAB "Settings" » Recurring Price AutoSync. Summarizing: Zero maintenance in WHMCS for Products and Configurable Options = Saving Money and valueable human working. 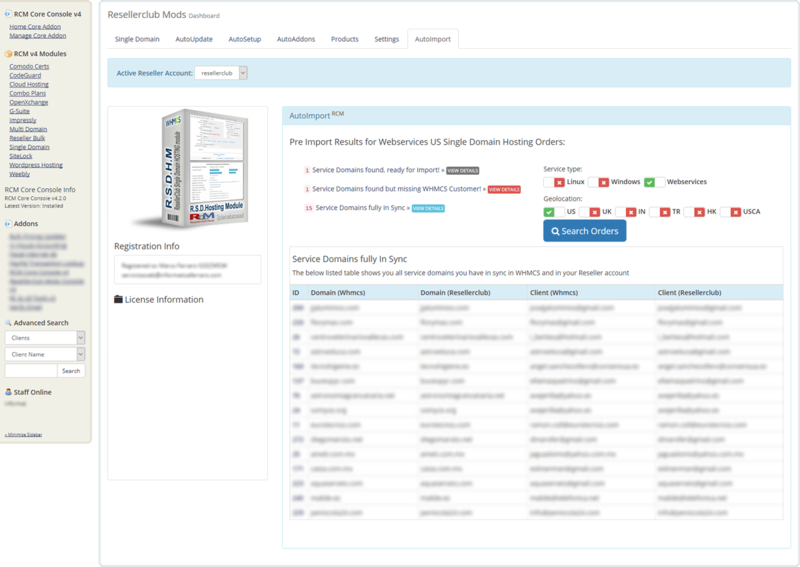 All you need to do is mainain all your selling prices in your Reseller account, indeed much more easier to update than in WHMCS, and activate the AutoSync Recurring Price option. It is recommended to leave the switch to enabled. Further details are available onscreen. The form is prefilled with the labels for Group Name, Group Description, Option Name and Options. Feel free to customize the labels. Some Configurable Option may require your attention! This applies only to migrated v3 Products currently not used by Customer Services as well as for Customer Services with the old v3 Configurable Option associated. In this case you need to select the current Configurable Option which is used for the Service Addons. Further details are available onscreen. Navigate in WHMCS to » Addons » RCM Core Console v4 and access the R.W.H.Provisioning Module Dashboard from the left sidebar Addon Menu or from the Core Addon Home widget.